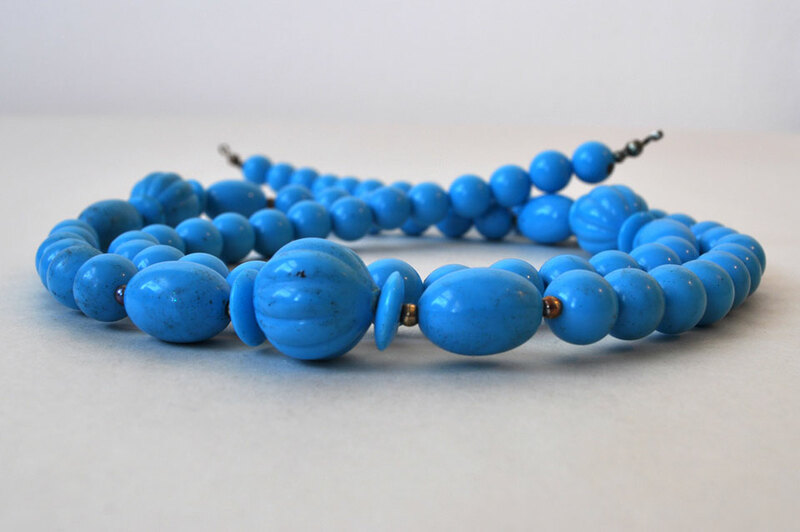 Turquoise (some kind of plastic) Beaded Necklace, Costume Jewelry. Last seen with Carmen Miranda Devil Costume c. Hallowe’en 2008. Of course I know there are variations between American and British/Canadian spelling, but today was the first day I became aware that jewellery fits into this category, as I went to tag this post “costume jewellery” I learned that Americans spell it jewelry. So I’ve spelt it both ways. Status: Could it be worn for every day wear? Or determine value and sell. The sea monster may be interested too – it could be called an aquamarine blue.